Note: If you would like to enter the giveaway, please comment on this post instead. Just wanted to let you all know that some of my patterns are now on Craftsy! I don't want to compete with local shops, so they are only in pdf form, but if you live in an area where they are hard to locate, you now have a solution! And have any of your checked out Madame Samm's blog today? She has the cutest Sunflower Pin Keep tutorial - no sewing so it is quick. I want to make one! Have a great day with lots of sewing! Woot! I'm one of those who has trouble finding your patterns....no local shop around. How nice to have your patterns in pdf available! Just visited and saw the cute pincushion; she is amazing, isn't she! Eu nunca comprei um padrão,os que eu tenho são amigas que vão para fora e trazem para mim.Mas vou verificar o meu orçamento deste mês,prometo.São lindos,eu até tenho 2 preferidos o primeiro e o terceiro das fotos.Obrigada e boa sorte com vendas. Your patterns are amazing! I love Blossoms. I am now a follower of yours. Your work is outstanding. 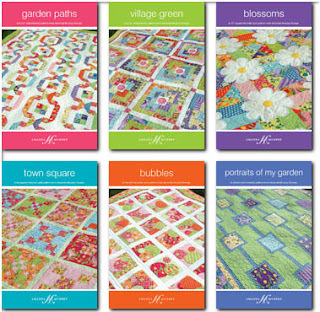 I can't wait to share with my quilting sisters. I love all your designs especially garden paths. I am glad you now provide patterns in pdf form as I live in a rural area that does not have access to much. Thanks again. I like the flowers on the blossoms pattern. Your patterns are beautiful. So hard to chose but my favorite is Village Green. Love your designs! Blossoms is my fave!